Morocco is one of the most fascinating lands in the world from the point of view of its geological structure and evolution. Our knowledge on the geology of the country has been greatly improved during the last decades, based on numerous seismic profiles and boreholes, seismological analysis of focal mechanisms, seismic tomography, gravimetric/geodetic modelling and, on the other hand, based on a big National Program of Geological Mapping including modern geochemical analyses (trace elements) and reliable isotopic datings (39Ar-40Ar, U-Pb zircon, Sm-Nd, etc). Moreover, a number of academic studies have been performed in relation with the increasing number of Moroccan universities. Accordingly, there was an utmost urgency to undertake a new treatise of Moroccan geology which could substitute for the classical Eléments de géologie marocaine, published in 1976 by A. Michard in the Notes et Mémoires du Service géologique du Maroc (re-edited twice since 1976, with more than 6000 copies sold, and… translated in Japanese for engineers!). A new treatise has been prepared between April 2006 and July 2007 under the coordination of A. Michard, assisted by O. Saddiqi, and A. Chalouan, by a wide panel of authors from Morocco, France or Belgium among the best connoisseurs of the country. 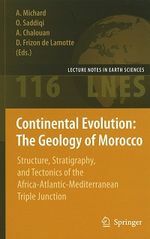 In order to emphasize the general interest of the book, we finally retain the following title: Continental Evolution: The Geology of Morocco. Structure, Stratigraphy, and Tectonics of the Africa-Atlantic-Mediterranean Triple junction.